Stem: green or tan, distally puberulent and sparsely hairy to tomentose. Leaf: 0.2--3(6.5) cm, cauline entire to toothed or lobed. 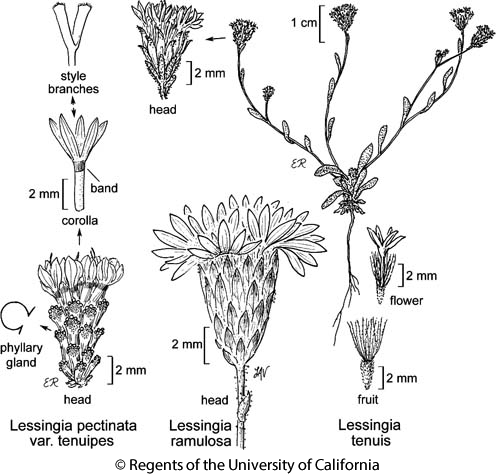 Synonyms: Lessingia glandulifera var. glandulifera, misappl. Unabridged Note: As here circumscribed, Lessingia pectinata var. tenuipes including plants with a colored band in corolla tubes and short-triangular style-branch appendages. Others have treated those plants as Lessingia glandulifera var. glandulifera. Here Lessingia glandulifera is applied elsewhere in the genus (to plants that lack a colored band in corolla tubes and have lanceolate style branch appendages). Citation for this treatment: Staci Markos 2012, Lessingia pectinata var. tenuipes, in Jepson Flora Project (eds.) Jepson eFlora, http://ucjeps.berkeley.edu/eflora/eflora_display.php?tid=81838, accessed on April 26, 2019.
c&s SNF, SnJV, SnFrB, SCoR. Markers link to CCH specimen records. Yellow markers indicate records that may provide evidence for eFlora range revision or may have georeferencing or identification issues. Purple markers indicate specimens collected from a garden, greenhouse, or other non-wild location.